Sometimes you just get lucky. 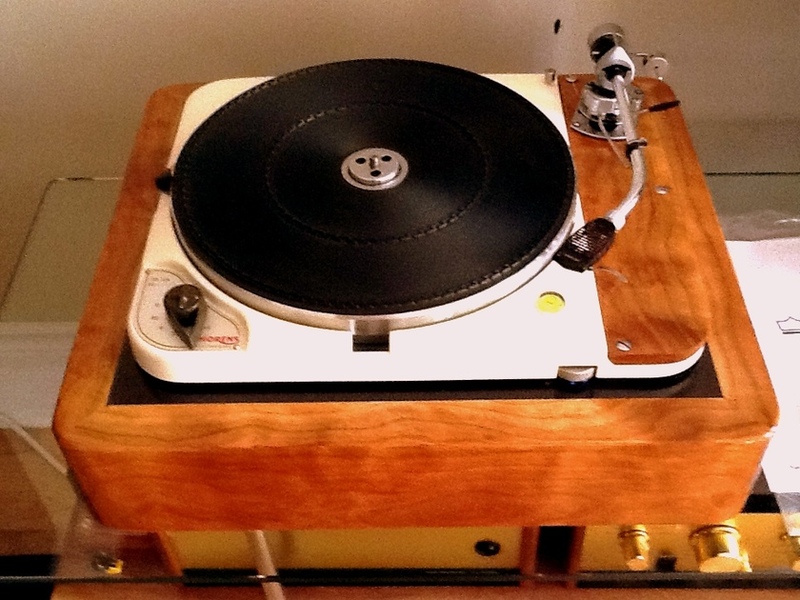 A few months ago, I posted a want ad on Canuck Audio Mart, asking to borrow a lower-end classic Thorens deck, a ‘popular’ model like the TD125, or TD160. The intent was to include one of these in a roundup comparison of $200-400 turntable solutions – this is an article I’d pledged to write, a while back when I was concluding the Pro-ject Debut Carbon review. In the past I had briefly owned a TD166-II, and was very impressed with the build quality (I think I paid $40 for it), but I didn’t trust my memory as to the sonics. I did feel that a Thorens should be a part of that comparo though, among others. As luck would have it, none of the offers I received ever materialized – except one. A generous local audiophile wrote me and offered to loan me his TD124 for review! Wow. Not what I was looking for, but an offer that was impossible to refuse. Thorens’ TD124 was a flagship product, introduced by the Swiss company in 1957 and being made for over a decade after. When you think of classic 1960’s idler-drive turntables that are still in high demand with audiophiles today, the list is short: Garrard’s 301 & 401, Lenco’s L75, the Thorens TD124, and the venerable EMT studio line. I’ve owned the Lenco, and heard several Garrards, and this would be my chance to sample the TD124. And what a TD124 it turned out to be. In this age of disposable, wow-today-gone-tomorrow electronics, few machines satisfy the eye (and often, the ear) the way a solidly-built, classic transcription turntable does. They mesmerize us with their deceptive simplicity, they cue us to remember our parents and grandparents, and our formative musical experiences. Their understated elegance bellows above the drone, asking for a place of permanence in our homes. Here is a delivery technology that, in one format or another, has survived, and matured, for over a century. A lifecycle unfathomable to most of today’s younger engineers. But I have to admit, I’ve always thought the stock TD124 to be a rather ugly turntable. The plinth is made of a resin with a white porcelain finish, and your first thought is “toilet bowl”. The switches, platter, mat and various original fitted tonearms all look utilitarian and dull. Targeted at the 1960’s classical musicphile, the TD124 was a ‘table completely devoid of any “moxy”. So when Bonnie and I arrived at Tyrone’s place and saw this, I was happily surprised. 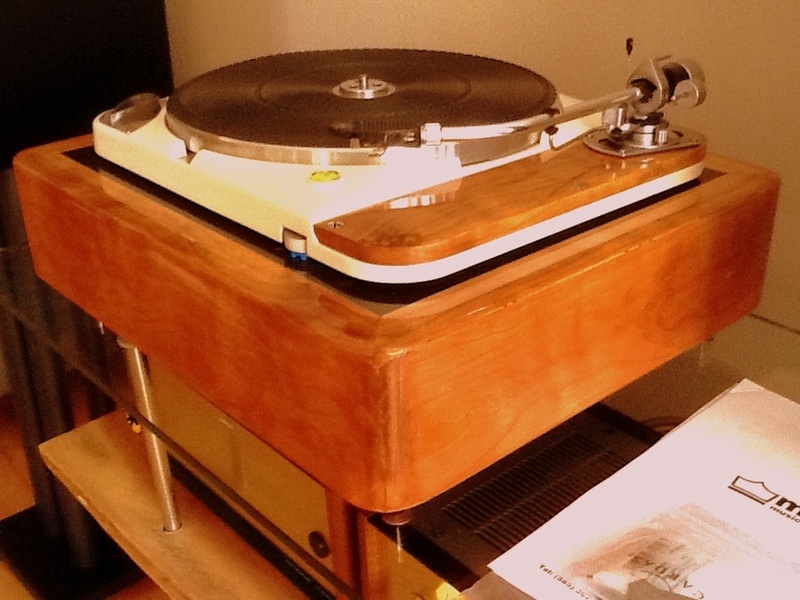 Thorens TD124, custom build by Hans Lazuardi. Fitted with an appropriately classic, though still modern-looking SME 3009 Series II tonearm, this is a very handsome deck indeed. I might have perhaps gone a bit further, and painted the plinth black, but the builder here clearly knew what he was doing. In fact, I like that he retained the TD’s clear “identity” – it’s a turntable with a strong and worthy reputation, why bury it? And needless to say, this is not a mere paint or veneer job; the new plinth is made from 1″ solid American curly cherrywood. Channels have been created below the surface for strategic damping. The support system, and back connections have been fully revised to modern spec. For a more thorough description of the customization, have a look at the original Audiogon listing here. The turntable weighs over 50 lbs., with its’ heavy duty detached power cable. Very substantial. After lugging the Hans-deck carefully up the stairs, and ignoring the back spasms, it was time to get this new-old Thorens set up and see how well it performed. Functionally, everything worked perfectly. The operation is quiet, speed adjustment and control were outstanding, the switches “purposeful” – in other words, solid, if unrefined by today’s measure. Well, you ask, how about the sonics? And this is where words begin to fail miserably, and I can empathize with my fellow audio scribes, as we try to employ verbs and adjectives to describe a sound, within an appropriate context. Custom build by Hans Lazuardi of Syracuse, NY. It’s the context here, that seems crucial. The TD124 makes music, it creates a musical experience, the way a Martin D-18 does, or a Denon DL103. It sounds wholly satisfying; it never fails to make you smile as it plays. And yet it never shouts, or tries to draw attention to itself. It’s not in the least bit boring, or flashy. In car terms, you could say it’s like a ’73 911 Carrera RS – a classic for all the right reasons; it performs with precision and gusto, the design is “right”, emitting a simplicity that belies the complexity of its’ engineering. If turntable (or motorcar) design had stopped evolving here, one could make a pretty good argument that “the goal” had been achieved. While motors have become more refined (and quieter), the resultant gains in speed accuracy have been fractional. Platters and bearings today are better-machined, and use more exotic materials. Do they sound better? I think it’s debatable. We’ve certainly been able to dig more sonic artifacts out of the groove, but does that really serve the domestic musical experience? In some cases, maybe. The automotive analogy is easy to follow. No one can argue the benefits in everyday use, of advancements like traction control, anti-lock brakes, or 8-speed automatic gearboxes. At the same time, owners of classic motorcars like the 911 still wake up early on Sunday mornings, their hearts racing just a little with anticipation. These are more than vehicles – they’re time machines that offer an experience like none other. Feeling the road, throwing it into a set of fast bends is still as thrilling as ever, it’s a pure visceral rush, unsullied by something as unimportant as ‘progress’. Yes, tongue in cheek, but still. The smiles are real because the experience is unparalleled – especially within the modern context. 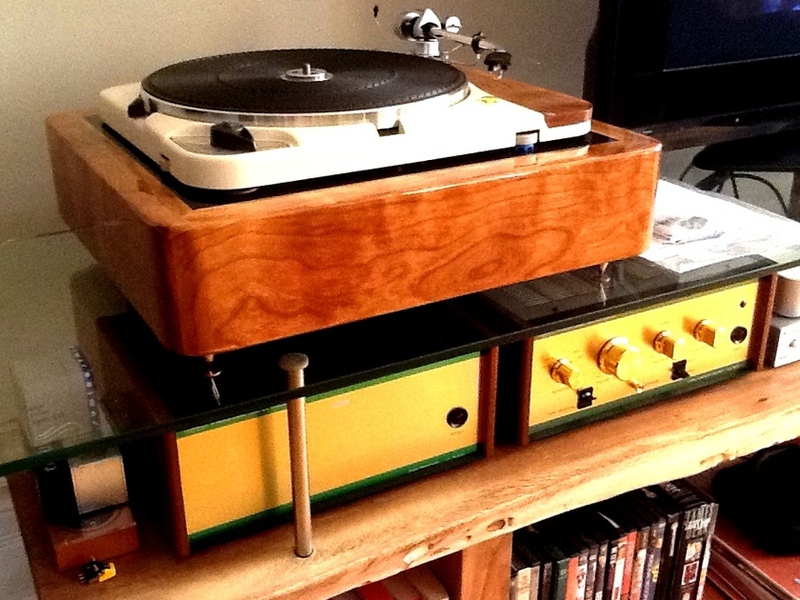 This turntable reminds me most, sonically, of the Garrard idlers. There’s a smooth refinement at work here, that serves the music extremely well. There is little to no emphasis on grandiose soundstage, or hyper detail extraction. At the same time, nothing seems missing. The Thorens will simply sound right. It doesn’t distract or make commotion. It might sound a tad “flat” to those weaned on modern ‘tronics, but that is hardly the point here. If you’re looking for an old 911, you don’t scour Craigslist for it. That’s where you go to find a deal on a low-mileage Corolla, or maybe an old winter beater. If you’re reading this turntable review, you already get it. Pictures really don’t do justice to the visual presence of this ‘table. It just looks so competent. I used the TD124 mainly with the Denon DL103, and it sounded and felt to me like a great match. Naturally, the 103 matches well and complements many turntables, but this seemed to me like a case of real sympatico. I think it’s because both of these components share the same energy, if you will, the same soul. I would have loved to hear this synergy tripled by employing my Quad ESL63’s, but one speaker was still in need of service, so that wasn’t possible. As to whether the Thorens is a better bet than the now very pricey Garrards, I think that’s a debate for another day. These are decks made for music lovers, and each has its’ charms. Suffice to say that if a TD124 crosses your path, it is very worthy of consideration. Expect to pay for the privilege – but in its’ current used value range (~$700-2000), the TD124 will be hard to beat. If the TD-124 you used had a ferrous, magnetically attractive main platter the denon moving coil had to be drawn toward it. You’ll have to say more?